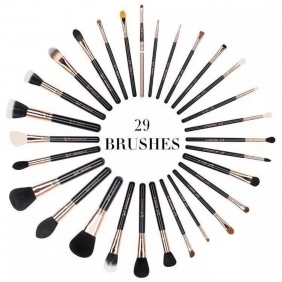 The Extravaganza Collection is a lavish assortment of hand-crafted brushes. 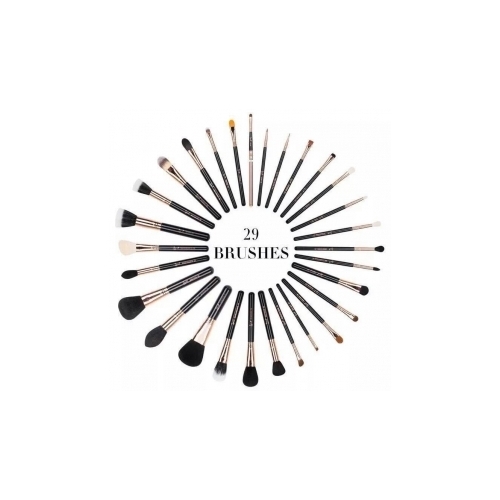 The Extravaganza Complete Kit features twenty-nine of our best-selling brushes and comes in a deluxe carrying case, perfect for traveling and storage. Everything you need for a luxurious makeup application. Brushes Included: E05 - Eye Liner: Create smooth and even lines. Use with gel or liquid liners. E10 - Small Eye Liner: Precise application of liner. Use with gel or liquid liners. E15 - Flat Definer: Sharp and precise application. Press product along upper and lower lash lines to create an easy thin liner. Works with gel, liquid or powder products. E20 - Short Shader: Concentrated color application. Apply color onto small areas of the eye such as the outer eyelid. Also use to smudge the lower lash line. E25 - Blending: Controlled blending. Blend colors together onto the lid with added control. Buff out harsh lines for a well blended effect. E30 - Pencil: Soften and smoke out lines. Soften pencil liners along the top and bottom lash lines, add shadow to line the eyes, or use to highlight inner corner of eyes. E35 - Tapered Blending: Controlled application of crease color. Using just the tip of the brush to pick up color, apply directly onto the crease and sweep through. Effect is blended, but defined. E40 - Tapered Blending: Soft blended crease. Using just the tips to apply color, sweep back and forth through the crease for a diffused and blended finish. E45 - Small Tapered Blending: Precise color application onto the crease. Picking up color with just the tip of the brush, apply intense colors to the crease to add depth and dimension to the eye. E50 - Large Fluff: Controlled highlighting. Apply highlighting shades onto the brow bone or upper cheekbone. Gives a soft and blended finish. E55 - Eye Shading: Even application of color. Place color across the whole lid for an even and strong application of product. E60 - Large Shader: Uniformly cover the whole lid with product. Apply cream shadow base or cream shadow for quick and even coverage. E65 - Small Angle: Create precise lining. Moves fluidly and easily across the upper and lower lash lines. Use with gel, cream or powder liners. E70 - Medium Angled Shading: Soft application of color. Use for brow highlighting or to blend the crease. F05 - Small Contouring: Contour cheeks. Buff and blend contour shades under cheekbone and jaw line for a chiseled look. F10 - Powder/Blush: Precise placement of blush. Use for powder application. F15 - Duo Fibre Powder/Blush: Soft blush application. Generates a diffused blush application. Works especially well with mineral product for a natural and delicate effect. F20 - Large Powder: Controlled bronzer application. Bronzing of the cheekbones and temple area. Using the flat side gives definition and control. F25 - Tapered Face: Exact product placement onto cheeks. Apply powder, blush or contour shades onto the cheeks and temples. Tapered shape gives exact placement of product. F30 - Large Powder: Even powder application .Uniform blending of powder products onto the face and body. F35 - Tapered Highlighter: Subtle highlighting. Apply highlighting shades onto the upper contours of the face. Diffused finish gives skin a natural glow. F40 - Large Angled Contour: Cheek application. Use the angle to softly contour the cheekbone. Can also be used to apply blush. F50 - Duo Fibre: Creates an airbrush effect onto the skin. Can be used with powder, liquid or cream products. F55 - Small Duo Fibre: Creates a controlled airbrush effect onto the skin. Use with cream or powder blush and highlighting products. F60 - Foundation: Smooth foundation application. Apply liquid or cream products such as foundation and primer. F65 - Large Concealer: Conceal larger areas of the face or body. Works well with liquid or cream products. F70 - Concealer: Conceal small areas. 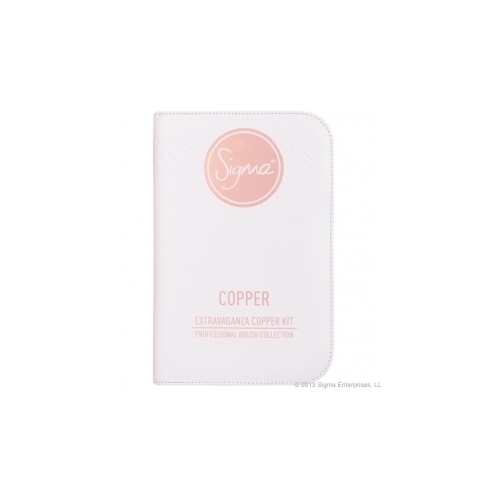 Conceal the hardest to reach areas such as around the nose and eyes. F75 - Concealer: Precise product placement. Use around the lip area to conceal when wearing bold lip colors. L05 - Lip: Precise application of color onto the lips. Use the firm edge to define and contour the lips. Good price and fast delivery especially compared to others! Thank u for the quick delivery . It means a lot to customers!! U are my first order website,Hope to continue doing business thank u !! 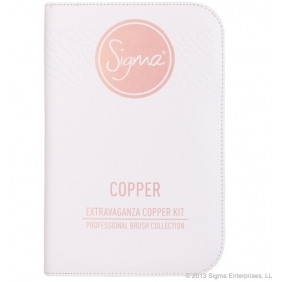 Affordable price, Packaged well, great communication, I am satisfied with Sigma extravaganza copper kit, it is worth the wait.